First Ever Your Next Stamp Blog Hop!!! First we have Skating Fun Fhiona. Isn't she the CUTEST!!! I colored her with Copics and actually used Glossy Accents on the ice although it isn't showing up in the picture. I also added Diamond Stickles to all the snowflakes and put Dew Drops in the centers of the punched snowflakes. The paper is PTI Aqua Mist and so is the ribbon. The dp is from the K&Company Peppermint Twist Mat Pad. I used Sweet Sunday Sketch Challenge #35 for my layout. The Little Birdie Christmas House set is a two piece set which features the birdhouse and this Happy Holidays sentiment that I used inside the card. Love it!!! My final card features this cutie patootie snowman called Freezy the Snowman : ) He is holding his little birdie friend which is just sooo sweet!!! I applied the snowflakes punched from my EK Success Snowflake Border Punch to the image panel, added Stardust Stickles to them and a small rhinestone center. The blue panel is embossed with the CB Snowflake Folder. I used Chocolate Chip, Baja Breeze, and Basic Grey Figgy Pudding paper. Leave me a comment telling me which card is your favorite for a chance to win! Thank you so much for stopping by, now head over to Maureen's blog for even more YNS goodness!!! Hmmm, Guess I gotta go with Fhiona! Though I do think Freezy is pretty cool. All fabulous cards! Love your layouts and the papers and 'bellies you used! Wow beautiful work love them all!!! Wow Kerri, all of them are fabulous! That Fhiona is just darling, and you did an amazing coloring job with her...love that ribbon! Love the DP and color combo with the bird house, it's so pretty! 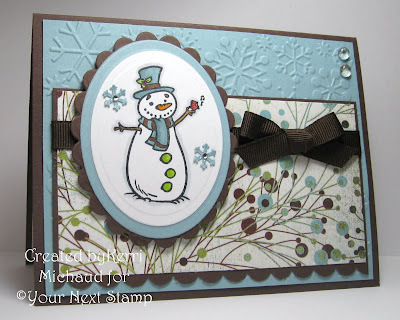 And finally, your lil snowman is such a cutie...lovely DP, great embossing...love 'em all girl! Excellent Job Kerri!!! Your Cards are adorable!! Love the snowman ... super cute! These are beautiful! I love your choice of colour combinations. Great work. and i'm off, hoppin' along! thanks for the fun! They're all beautiful, but the colors and patterns you've used on the first and last cards are STUNNING! These are all DELIGHTFUL Kerri! I think that first one is my fav!! You are tooooo awesome!! Awesome cards, Kerri! Those images are adorable!!! Love it love it! Especially what you've done with the snowman! Love all of your cards- the color combinations are great! The snowman one is my favorite! Wow these are some fanatic and inspiring cards. I just love all the layers, details and bling on all of them. I am so in love with Fhoina. Kerri what fabulous cards! Your cards always give me that warm and fuzzy feeling! They are so stylish and elegant! Love them all!!! All your cards are amazing...I especially love the Little Birdie Christmas House!! Gorgeous cards, I am loving these new stamps, they are so cute!! Ohh, I just love the last one and your choice of patterned paper to use with it. I also love the inside of the Little Birdie Christmas House card; it makes me realize just how much more effort I should put into finishing the inside of my cards! Kerri these are super cute and beautiful!!!! I love your stitching and those beautiful colors on your first card!!! Darling! CUTE cards! Love the snowman! Wow each of your cards is just as adorable as the last one. Love Skating Fhinoa, The sweet little bird house and that adorable little snowman. I love all of your cards but the snowman is just adorable. I love the blue and brown combination. Love the pearlized paper you used with the skating Fhiona! Oh I love the cards with the non-traditional colors...as in not red and green for the holidays. These are all just great cards. That little girl and your coloring on the first one is just fantastic! All three of these cards are gorgeous, and it's hard to pick a favorite, but I'd go with skating Fhiona ~ I love the colors on this card, the stitching and that bow is just perfect! That's hard to pick a favorite because I love them all...but I guess...the snowman, because I love the chocolate and turquoise combination! I just happened to come across your next stamp while doing a random google search and I was SO excited to see all of the UBER cute stamps!!! They are SO cute that I was doing my little happy dance and MUST own at least one of each set! I love the new Fiona sets that were just released!!! Thanks for the chance to win some of these MEGA cute stamps!!!!!! Very cute cards! I love the little happy dancing Fhiona! You did an amzing job with the skating scene! 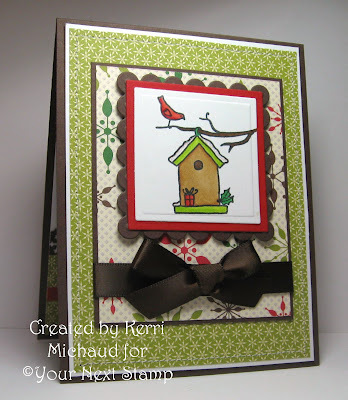 Gorgeous bird house card! Love the inside very much! And what an adorable snowman! Really love the paper you chose and little snowflakes you added! To pick a favorite? They are all my favorite! You are very talented, Kerri! LOVE the Little Birdie Christmas House card! Your cards have great color combinations! Fabulous cards Kerri. I love how they are all perfectly done, no detail was missed. Great job! These are all so cute. I love the fresh colors of the skater and she is just darling. Your snowman just makes me smile. And the bird house is so warm and pretty. Fantastic cards girlie. All 3 of these are amazing!!! that little skater is a must have, you paired her with such gorgeous colors! i'm lovin' that birdhouse card!!! great coloring! AS everyone seems to tell you, I too love your work. Its all about creativity and color combo. I just love Fhiona and the Teals and Aquas are my favorite colors with browns. SO I am immediatly in love with your Fhiona Skate card, then as I pan through I am awed by your bird house that reminds me of my Grandmother and the type of stamping she used to create (RIP). THEN I get to your Snowman! The color combos and creativity is just lovely! I am torn between the Fhiona and Snowman both. If I had to pick one........ AHHHHHHHHHH the Snowman! Love Him!! Kerri! YOur cards are just amazing! I absolutely hands down love the ice skating fhiona the very best! super job on the blog hop! I don't think I have a fave here - they are all fantastic - thanks for sharing!! Love your cards but my favourite has to be the Christmas snowman. Your card making is always inspiring to me. I just love what you come up with creatively. My favorite of the 3, is the cute little snowman one. While I hate winter, I love snowmen, and your snowman card is awesome! Love the top card with the birdhouse. I'm a bit coo coo in the head about birds, birdhouses and birdcages, lol. Love the color combo on your Fhiona card, the delightful scene on the Little Birdie Christmas House and the texture on the little Freezy Snowman. These are all cute! All these cards are fantastic creation! But the last one is my favorite. WOWzers!! Your cards are FABULOUS! !